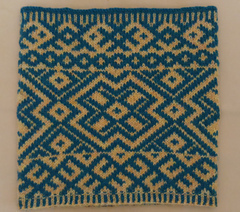 This two-color Fair Isle pattern is a relatively easy knit and a good way to practice color stranding. 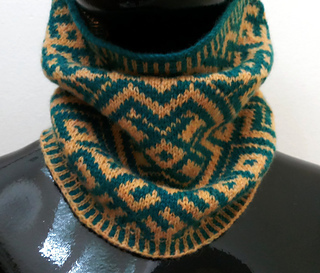 The neckwarmer/cowl is meant to be a snug fit - and measures 19.5 x 9.5 inches (49.5 x 24.1 cm). 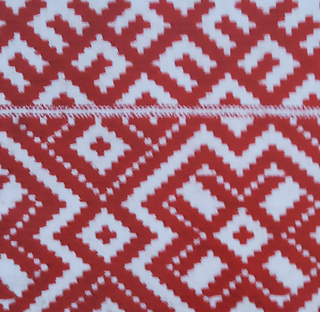 The pattern is based on a traditional Russian Kargopol embroidery design - worked in red thread on a white background. 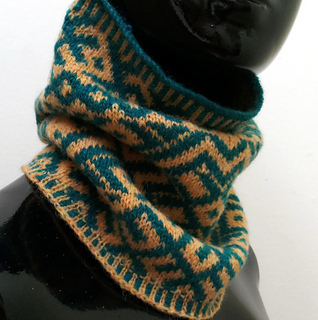 I chose to knit this in a blueish green color as the primary color and a golden yellow as the secondary color.